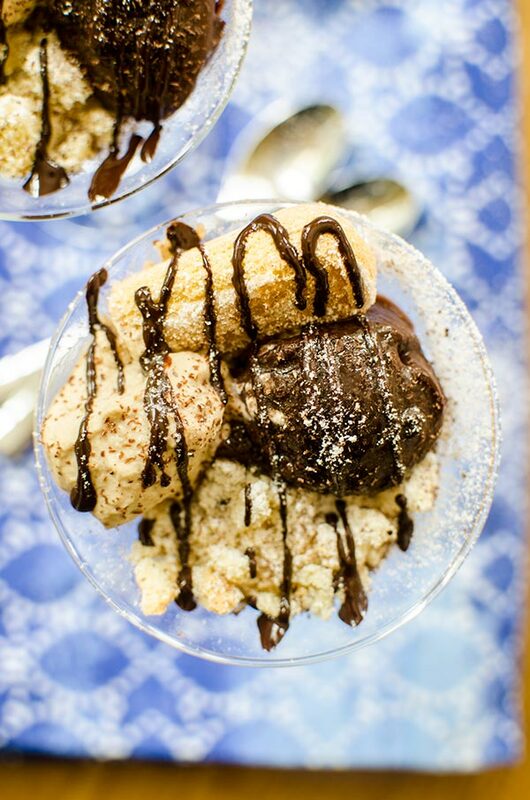 Tiramisu pudding parfaits are the perfect quick dessert with coffee whipped cream, lady finger cookies and chocolate pudding. As much as I love to eat really complicated and intricate desserts, I find that I don’t usually have a reason to make those kinds of desserts or a lot of time to put into them. So, I tend to go for the easy, 20-minute sort of desserts that look like they took a lot more time and effort. I think that this is probably a little more realistic for most of us. Right? Growing up, we didn’t have desserts after every meal; they were saved for special occasions, holidays or just as a little surprise treat. For as long as I can remember, I’ve always loved chocolate desserts, and chocolate pudding was one of my absolute favourites. It’s been years since I had chocolate pudding, but it’s one of those treats that is so nostalgic for me. Nostalgia, it coats memories and moments with a rosy-coloured lens. Along with smells, I think food is one of those things that is really nostalgic for people. I wrote about quiche and how it reminds me university, popcorn reminds me of going to movies with my mom as we checked off all of the Oscar-nominated movies on our list, and chocolate pudding reminds me of opening my lunch in elementary school to find my favourite snack. If you want to try these new pudding cups, you can find them in the refrigerated dessert aisle at your grocery store (and you can even use this coupon for a better deal). They also have a new S’mores flavour which is equally as delicious! In a small bowl, whisk instant coffee with 2 tsp of heavy cream. Whisk until instant coffee is dissolved. In a medium bowl, beat coffee-cream mixture with remaining cream and vanilla extract until soft peaks form. Add in powdered sugar and continue beating until stiff peaks form. Set aside. To assemble, divide crumbled lady finger cookies into 8 miniature martini glasses or ramekins. Top with one heaping tbsp of HERSEY chocolate pudding and 1 tbsp of coffee whipped cream. Top with powdered sugar and drizzle with chocolate. Repeat with remaining ingredients. Disclosure: This post was sponsored by KraftHeinz Canada – as always, all opinions are my own. 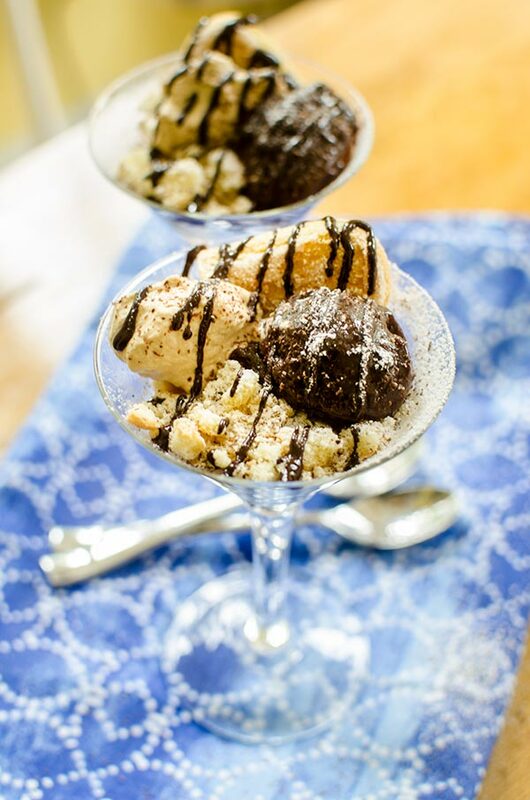 Thank you for supporting my sponsors and allowing me to continue creating recipes like these tiramisu pudding parfaits. 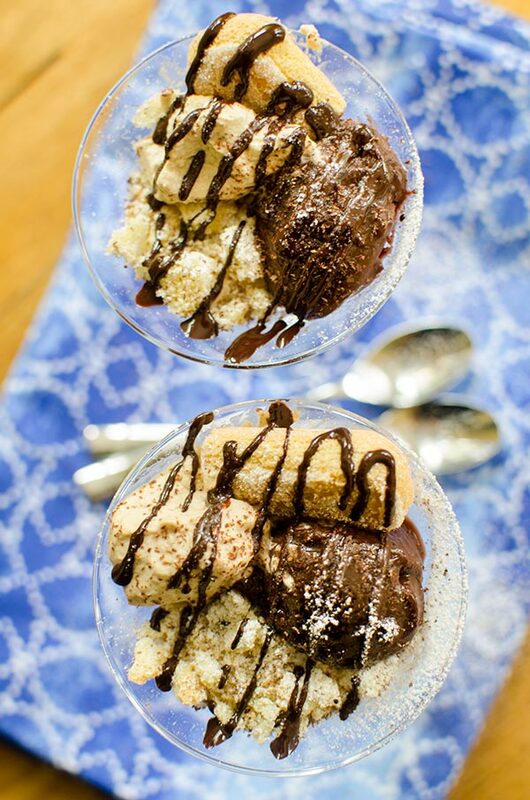 This tiramisu dessert looks delicious & soooo easy to make! I am going to make it for my card ladies; they will love it! Love your photos & your commentary, as always! This looks so awesome. And your photos are amazing. I absolutely love it. So great.